During Vice-President Xi Jinping's recent visit to Tibet, I mentioned the absence of the Panchen Lama in the entourage of the future Chinese President. Reading this article of Radio Free Asia, one understands better the embarrassment that the young Lama, who has never been accepted by the majority of Tibetans, could have been for Xi Jinping. One year before his 'elevation' to the supreme post of the People's Republic of China, Xi decided not to take the risk of an incident. Even during the main function in front of the Potala, while Xi Jinping was delivering his speech, beautiful dressed Tibetans seemed very bored, some of them leaving their seats. The Chinese government attempted to parade its handpicked Panchen Lama this month in a key Tibetan-majority area but shelved the controversial move following widespread resentment from the people, sources said this week. Extraordinary security measures were taken in recent weeks for the 21-year-old Gyaincain (in Tibetan, Gyaltsen) Norbu to visit the Labrang monastery in Sangchu county in the Kanlho (in Chinese, Gannan) Tibetan Autonomous Prefecture in China’s Gansu province. A Tibetan man living in the Labrang area said Tibetan laypeople and monks at the monastery were unhappy when they heard about the proposed visit. The Labrang monastery, a key institution in Tibetan Buddhism, was the scene of widely publicized demonstrations against Chinese rule during regionwide protests in 2008. “He was supposed to come sometime from July 20-30, but now people say he may come sometime in August or September,” the man told RFA on Friday. “For now, because of widespread discontent among the local Tibetans—both laypeople and the monks at Labrang—preparations appear to have been suspended,” he said. 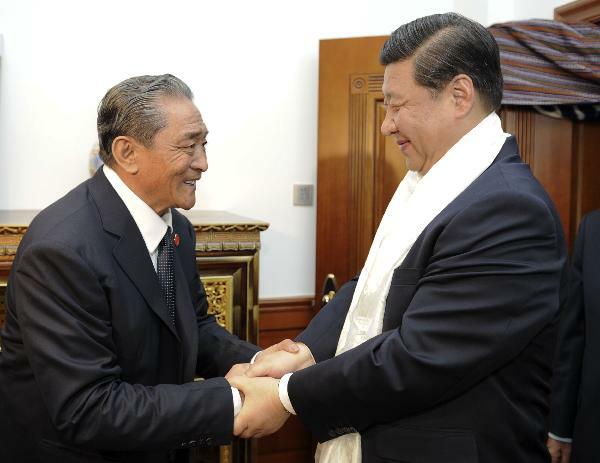 According to him, Tibetan staff at government offices displayed reluctance to support the visit even after Chinese authorities warned that they could be dismissed or have their salaries slashed for refusing to welcome him. “Chinese authorities ordered Tibetan staff at the Sangchu (in Chinese, Xiahe) county offices to be ready to welcome him joyously, and offer scarves and prostrations," he said. Chinese authorities have had difficulty persuading Tibetans to accept Gyaincain Norbu as the official face of Tibetan Buddhism in China. Beijing named him to be the Panchen Lama in 1995 in a retaliatory action after the exiled Dalai Lama identified six-year-old Gendun Choekyi Nyima as the reincarnation of the second-highest monk in Tibetan Buddhism. The boy selected by the Dalai Lama disappeared together with his family soon after and has not been heard from since. 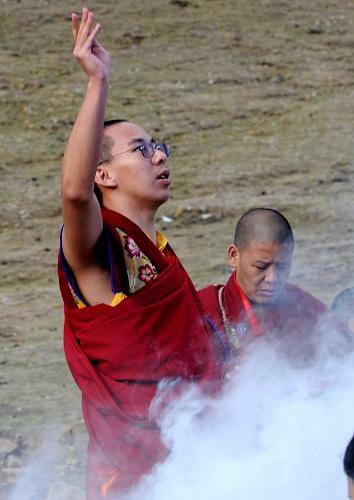 Most Tibetans believe Chinese authorities are keeping him in detention. "The Chinese authorities [have been] telling the local Tibetans that they have to come out to welcome the Panchen Lama when he arrives,” a Tibetan woman living near Labrang said on Wednesday. “A few years ago, the Chinese government brought the Panchen Lama to Labrang, but the local people refused to attend. This year, too, many Tibetans are saying that they won’t come out to show respect,” she said. More than 1,000 Chinese police and security forces, including plainclothes police, were stationed around the monastery to prepare for the visit, she said. Beijing has announced that upon the eventual death of the present fourteenth Dalai Lama, they will appoint his successor, raising the possibility of there being two Dalai Lamas—one recognized by China and the other chosen by exiles. Gyaincain Norbu made his political debut in May last year at the annual session of the Chinese People's Political Consultative Conference (CPPCC) in Beijing, appearing as a national committee member of the top political advisory body. He has also been made the vice president of China's state-run Buddhist Association. The Tibetan government-in-exile and exiled Tibetans insist that Gyaincain Norbu is not the legitimate 11th Panchen Lama, since he was appointed by the Chinese government and is not acknowledged by the Dalai Lama as the reincarnation of the 10th Panchen Lama. Reported by Sonam Wangdu and Chakmo Tso for RFA’s Tibetan service. Translations by Tsewang Norbu and Tamdin Wangchuk. Written in English by Richard Finney and Parameswaran Ponnudurai. When I read this article Road to progress in The China Daily, it reminded me of something I wrote 10 years ago. I was then speculating about the possibility to build a mega in Metok area near the Indian boder of Arunachal. But in 2000, before becoming Premier Wen Jiabao had declared: "In the 21st century, the construction of large dams will play a key role in exploiting China's water resources, controlling floods and droughts, and pushing the national economy and the country's modernization forward. " Today, with the opening of Metok (or Medog) to the rest of the world, the infrastructure is in place to construct a large dam. The reversion scheme has in the meantime been shifted upstream on the Brahmaputra as it makes better sense to divert waters from a higher altitude. The dam however could produce the necessary power necessary for the diversion. 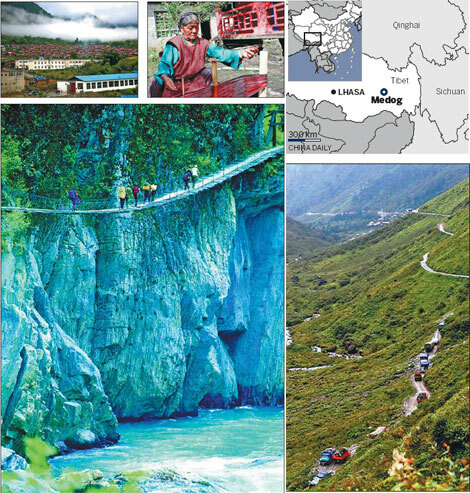 Clockwise from above: Medog was cut off from the outside world by difficult terrain, a volatile climate, frequent landslides, floods and avalanches; The county has long been regarded as one of the most challenging destinations, as access was mostly by foot; Rows of red-roofed houses now stand at the foot of the mountain in Medog; The Monba people follow a traditional way of life, an important part of which is weaving. Medog in Tibet has transformed itself in just a decade from sleepy, cut-off county to a prosperous and environmentally aware tourist destination. Cheng Weidong reports. The first time I visited Medog, a remote county on the southern slope of the Himalayas, in Tibet autonomous region, the only mode of transport was horses and human porters. That was in 1999. The county, whose name means "lotus" in Tibetan, was cut off from the outside world by difficult terrain, a volatile climate, frequent landslides, floods, mudslides and avalanches. At the end of 2010, I returned and the changes were dramatic. Medog covers an area of 30,550 sq km. The Yarlung Zangbo river runs through it before flowing into India. Its population of 11,000 is made up of the Monba and Lhoba ethnic groups. To adventurers, it has long been regarded as one of the most challenging destinations to get to, as access was by foot and involved climbing Galongla Mountain. When I visited Medog in 1999, I wrote in my notebook the Monba people living here had a primitive lifestyle. A short, bumpy section of the old Medog highway was accessible by car two months of the year by experienced local drivers, but otherwise it was just horses and human porters transporting life's necessities. On Dec 15, 2010, a two-year effort bore fruit when the Galongla Tunnel, the most challenging part of the Medog highway project, was completed. This will make it possible for a modern highway to connect with the county by 2012. On my second visit there, we drove through the newly built tunnel. When our car drove slowly onto Medog's county road, which had a concrete surface, it was as if we were driving on smooth glass. Then someone pointed out a town on the mountain slope and said: "Here we are; it's Medog." I could hardly recognize it. It was quite a different place from the small village in my memory. The first thing I noticed was the newly completed "Good Life Lotus Square". Engraved on its monument are the words: "Medog is surrounded by mountains and its shape resembles that of a lotus." In Buddhism, the lotus is a symbol of auspiciousness. Though the only consumer products from this area are stone pots and ebony chopsticks, it has abundant natural resources. As we drove slowly through the town, I saw a hospital, police station, shops, restaurants, bars, Internet cafes, clothing stores, hair salons, guest houses and farmers' market. We stopped at a new building, the Lotus Hotel of Medog, where we would stay during our visit. On first night in the new Medog, we dined at a restaurant called Guests Bring Prosperity. The owner came to Medog from Sichuan province in 2003. "It is good here," she said. "Medog has changed so much. Many things are less expensive now. You can buy instant noodles or a bottle of purified water for just 5 yuan (77 US cents)," the woman surnamed Xia told me. It drizzled all night long, bringing back memories of my stay 11 years ago. Back then, during Medog's rainy season, there was mud everywhere. The most impressive building was an auditorium constructed of reinforced concrete. A businessman from Sichuan owned the largest store in town but goods were limited and prices were high. A chicken sold for as much as 100 yuan ($15.50), and a carton of cigarettes cost 600 yuan. The reason prices were so high was that all goods had to be transported by porters. Now, there are more than 200 businesses in town and about 400 cars. There are two ring roads and a third one is being built. The next morning, when I woke up around 6 am, it was still drizzling. I went to a vantage point nearby to take some panoramic photos. The rain stopped. Medog was shrouded in mist. The surrounding rice paddies looked golden and the houses shimmered against the backdrop of the mountains. The view was breathtaking. Then, I went to Medog Village, a Lhoba village of 89 households, to take more photos. The houses in the village are made of wood, and the 600 villagers still follow a traditional way of life. Even so, there are some 70 cars in the village and many villagers are involved in the transport business. Qunzeng invited me into his house. He has three kids. His entire extended family has around 80 members. Qunzeng said the Lhoba people used to live by hunting and they fell trees to build houses and cook. 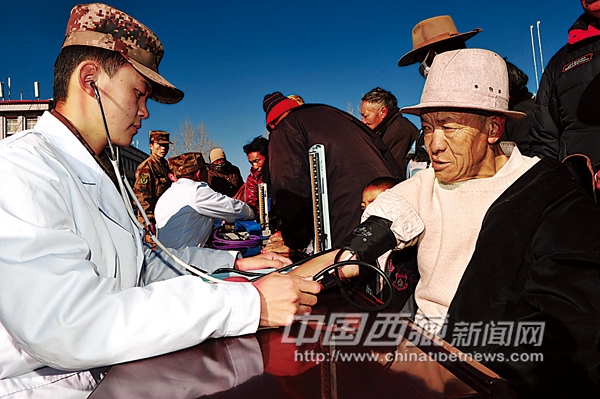 In order to protect the environment, the regional government compensates each Lhoba villager 5,000-6,000 yuan a year to switch to a more modern lifestyle and not hunt or fell trees. Thus a big family can get as much as 70,000 yuan a year. When I stepped into Qunzeng's house, his aunt was sitting in the yard dressed in traditional Lhoba clothes to welcome me. Then, Qunzeng's brothers and his nephews and nieces stopped by. Seeing these three generations talking and hugging was a poignant snapshot of the life and times of Medog. My article China's economic quake shakes the west appeared yesterday in DNA. 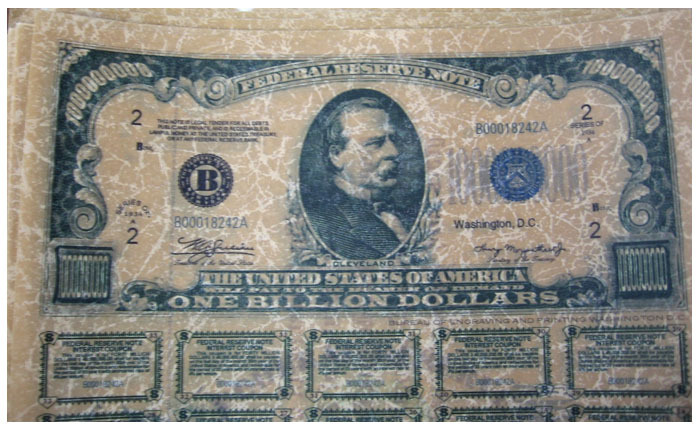 Certain analysts believe that a forthcoming economic crisis could be ten times more serious than the one triggered by the Lehman Brothers’ collapse in 2008. According to The People's Daily, the Dalai Lama is not serious in looking for a solution to the Tibetan issue. Interestingly, the mouth piece of the Communist government announces that Vice-President Xi Jinping, who will replace President Hu Jintao in 2012, "will not ease Beijing's stance toward the region". Perhaps not, but the truth is that since 2006, the Chinese government has given up the possibility to find a compromise with Dharamsala. “In previous meetings, the envoys had requested to visit other autonomous regions of China, which is why Guangxi Autonomous Region was chosen. After the meetings concluded, Lodi Gyari reported that there was “a growing understanding between the two sides, though fundamental differences persisted.” However, he made clear that the Tibetans remained committed to the dialogue process and still hope that some progress was possible through continuous engagement. For the outside, the Tibetan envoys kept a brave face but the Chinese were not interested any more in the negotiation process. An incident had occurred in between which made change their mind. "In what is most daring display of loyalty and support to the recent call by the Dalai Lama to ban using tiger and leopard skins in Tibet, Tibetans in Amdo region in eastern Tibet are making bon fires out of their animal skin clothes. animal skins. Literally excited crowds throw their animal skin hats, shirts and cloak like dress "Chuba" on the fire. Nagpa who brought the CD from Nepal after secretly meeting his counterparts at the Nepal-Tibet border said: "Tibetans in Tibet took great risks in making these images available to outside world and it reached here in record time of ten days." Ngakpa who arrived Dharamsala this morning, talked exclusively to Times of India. "Though there were many people, who shot the event on camera, there was immediate curb from the Chinese authorities on the photographic materials, confiscating cameras, and detaining who resisted" he said. "The local Chinese authorities are left with no answers to the earlier such reports in World Wide Web. 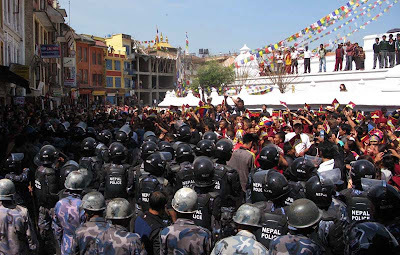 "Eight youth activist have been arrested for working in 'collusion' with Dalai Lama government" said Nagpa. However, they are expected to be released soon, as the group involved three Chinese youths also. On another note, the Chinese authorities have now started calling this as results of their environmental education. However, According to Nagpa the tension between the authorities banning such public gatherings only seems to be rising as bonfires are now being set in all the places in Amdo region or Tibet. "The reason seems to be obvious to ask. The Tibetan leader who was giving the Kalachakra blessings at Amravati recently called on the Tibetans to stop using animal skins like tiger and leopard. This was attended by about almost 10,000 Tibetans who came from Tibet especially for the Buddhist congregation. However, Nagpa says the Tibetans in Tibet are advocating clean environmental and loving animals as per the Buddhist way of life as reasons to ban animal skins for clothes form this New Year." The Chinese had finally realized the Dalai Lama's tremendous influence on the Tibetan masses and the danger of any 'settlement' of the long-pending issue with the Tibetan leader. The unrest in March/April 2008 comforted the Chinese in their position: "the central government will never make concessions", they continue to affirm today. For internal consumption, they have to put the blame on the Dalai Lama. The Tibetan Center for Human Rights and Democracy wrote in its 2006 yearly report: "In early February and July 2006, it became evident that the Dalai Lama rules the hearts and minds of Tibetan people inside Tibet. In an instant reaction to a call by the Dalai Lama based in India banning use of wildlife skin, Tibetans burnt large quantities of garments made of animal pelt. 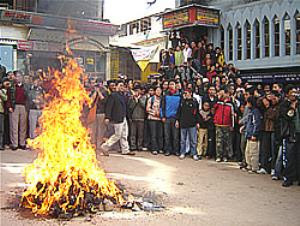 Public bonfires of burning animal skin were reported from several parts of Tibet; Rebkong, Labrang, Kardze, Chantsa, Ngaba TAP, Kirti Monastery, and Lhasa." 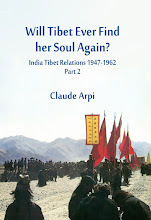 The Chinese conclusion was (and is) "No use to continue talking to the Tibetans". Tibet's exiled spiritual leader the Dalai Lama is not serious about talking with Beijing, but the government will never make any compromises with him to get him back to the table, a major Chinese newspaper said on Tuesday. China, while always keeping a tight grip on Tibet, has been more hardline than normal of late, as senior leaders gear up for a key leadership transition starting from late next year and take steps to ensure nothing distracts from that. Vice-President Xi Jinping, who is widely expected to become president in 2013, gave a toughly worded speech last week in Tibet, suggesting that China's heir apparent to the presidency will not ease Beijing's stance toward the region. The commentary in Communist Party mouthpiece, the People's Daily, continued in that vein, saying the Dalai Lama's recent remarks on his overseas visits show that he will never accept Beijing's preconditions for talks. "The Dalai Lama's recent comments clearly show that their position is totally and diametrically opposite that of the central government," the newspaper wrote, referring to the exiled Tibetans. "(He) has no sincere intention to talk, and no interest in talks. In reality, (he) has already completely blocked the path to talks," it added. President Barack Obama's meeting with the Dalai Lama at the White House this month infuriated China, which brooks no "outside interference" in what it considers a purely internal matter. China says that it will only talk about the Dalai Lama's personal future, but not with the government-in-exile, and that the Nobel Peace Prize laureate monk must renounce his support for Tibetan independence. The newspaper used extensive quotes from the Dalai Lama to demonstrate his "inflammatory" support for Tibet's independence, and cited his suggestions that China's Communist Party had its day and should now step down. The Dalai Lama says he wants only true autonomy for Tibet, something China says it already has. "There is only one possibility, and that is that the Dalai Lama moves toward accepting the central government's demands, for the central government will never make concessions," the paper said. China has held on-off talks with the Dalai Lama's envoys for several years, without any sign of progress. China has ruled Tibet with an iron fist since 1950, when Communist troops marched in and announced its "peaceful liberation." The Dalai Lama fled to India in 1959 following a failed uprising, and unrest has continued sporadically ever since. My article Why Xi Jinping's visit to Tibet is important is posted in Rediff.com. Chinese Vice President Xi Jinping, who will takeover as president next year, seems to have realised that the past policy of repression can't solve the long-pending Tibetan issue, says Claude Arpi. The visit of the Chinese Vice President Xi Jinping to Tibet to celebrate the 60th anniversary of the 17-point agreement between China and Tibet is important for several reasons. First, in one year, Jinping will replace Hu Jintao as the President of the People's Republic of China; he will also assume the mantle of general secretary of the Chinese Communist Party and a few months later, he will take control of the all-powerful People's Liberation Army as the chairman of the Central Military Commission. Jinping has then a strong past connection with Tibet through his father Xi Zhongxun who was responsible for Tibet's affairs in the 1980s. It is also a fact that visits to the Roof of the World by high dignitaries from Beijing are as rarified as the air on the plateau. When he was still vice president in May 2001, Hu Jintao visited Lhasa (Hu was promoted to the supreme post). His speech was not very different from the one Jinping just delivered on the square in front of the Potala. Hu had declared, "The peaceful liberation of Tibet was a major event in modern Chinese history and an epoch-making turning point in the course of development in Tibet. It symbolised that Tibet once and for all cast off the yoke of imperialist aggression and that the great unity of the Chinese nation and its great reunification cause have entered a new period of development. It ushered in a new era in which Tibet would turn from darkness to light, from backwardness to progress, from poverty to affluence and from seclusion to openness." Ten years later, foreigners were not allowed into Tibet for a month around the visit of Jinping. It is a difficult situation: Beijing always enjoys putting India into a corner. On one side, it is tough for the karatekas to be unable to participate in an international competition, like any other citizens of India, but if Delhi starts accepting stapled visas, this will an admission that Arunachal Pradesh is a disputed area, when it is not. Kiren Rijuju, the former young MP from Arunachal asked Foreign Minister S M Krishna to accept stapled visas "if some assurances on resolution of the border issues could be obtained from Beijing". The problem is that Beijing will never give any assurance. Another issue is that the Chinese government keeps changing its stance on the issuance of visas for Kashmir and Arunachal. It is not easy to find a solution. One should however note that General Chen Bingde, Chief of General Staff of the PLA (and member of the Central Military Commission) did not accompany Vice-President Xi Jinping to Nyingtri Prefecture, north of Arunachal . He headed for Ngari (Western Tibet) with some other members of the delegation from Beijing. The Korean press reported that a few days earlier General Chen Bingde launched into a 15-minute tirade against the US during a meeting with South Korean Defense Minister Kim Kwan-jin. Chen would have said, "Being a superpower, the US says this or that to other countries, but it never listens when other countries express themselves in a similar way." Chen added the actions of the US suggest it wants to 'overpower' other countries. South Korea considered Chen's comments as highly discourteous and violating the diplomatic protocol. No report of his visit in Western Tibet (north to J&K and Himachal border) has appeared so far, except for the caption of this picture (Chen Bingde (R), chief of the General Staff of the Chinese People's Liberation Army, arrives in Ali [Ngari] of southwest China's Tibet Autonomous Region, July 21, 2011. 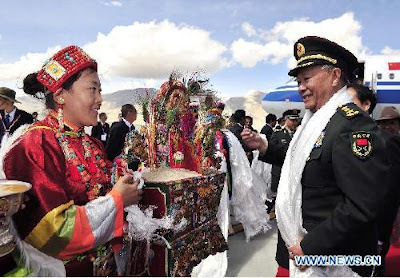 Chen Bingde is in Tibet to attend celebrations marking the 60th anniversary of the region's peaceful liberation. (Xinhua). NEW DELHI: Disgruntlement over China's decision to issue stapled visas to Arunachal Pradesh residents took a new turn with former MP Kirren Rijuju suggesting that the visa regime be accepted, a stand supported by the state's Olympic association as well. With a five-member karate team stopped from travelling to China for a competition, Rijuju wrote to foreign minister S M Krishna that stapled visas be accepted if some assurances on resolution of the border issues could be obtained from Beijing. It was hurtful when the karatekas were turned back from the airport, he said. Rijuju, who is also principal advisor to chief minister Jarbom Gamblin, wrote to Krishna on Friday as a former MP. In response to a previous letter, Krishna informed Rijuju that "by following a two-track visa policy, China has disputed the legality of our international borders thereby impinging adversely on our national sovereignty as well as territorial integrity". Arguing that there could not be any discrimination against Indian visa applicants on grounds of domicile, Krishna noted that the Chinese foreign office has categorically stated that Beijing's position was unchanged. "Our acceptance, thereby, of stapled visas would imply dilution of our stand towards Chinese claims," he said. But Rijuju has again expressed apprehension that Arunachalese people may not be able to attend events in China and that India "may require a shift in its strategy without compromising on national interest". The former MP argued that China was an important destination in economic terms and though he did not spell out how national interest could be safeguarded while accepting stapled visas, his position was echoed by the Arunachal Olympic Association. 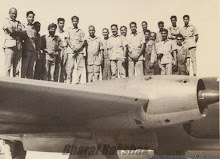 The AOA requested the Centre to accept stapled visas till the dispute was resolved. "People of Arunachal Pradesh, especially sportspersons, should be allowed to travel to China with stapled visa until both the countries resolve the issue," the organisation's secretary general G Doke said, according to an agency report. The association and Rijuju's statements came on Friday. "The incident is no less than a humiliation. People of this remote northeastern state have been repeatedly denied normal visas as if they were not Indian citizens," Doke said. The team, including officials, was on its way to Guangzhou to represent India at the Asian Karate-do Championship from July 20 to 25. Rijuju was, however, issued a regular visa while visiting China during the Beijing Olympic Games in 2008. "I do not know how China changed its position again thereafter," he wrote to Krishna. Doke asked the Centre to resolve the visa problem with China without delay so that people of the state did not face the same problem in future. The final leg of Xi Jinping's one-week tour to Tibet was the Tashilhunpo monastery, the seat of the Panchen Lamas that the Chinese have traditionally tried to play against the Dalai Lamas. As I noted earlier, Gyaltsen Norbu, the Panchen Lama selected by Beijing was nowhere to be seen in the entourage of Xi. Norbu is said to be close to Raidi, the hardliner who was TAR Chairman from 1993 to 2003; both are natives from the same area in Nagchu. Gyaltsen Norbu usually spent a month every summer in Tashilunpo Monastery. It is in the Tashilunpo that the previous Panchen Lama (the Tenth) passed away in mysterious circumstances. "The Panchen Lama died during a rare trip in 1989 to the traditional seat of the Panchen Lamas in Shigatse. 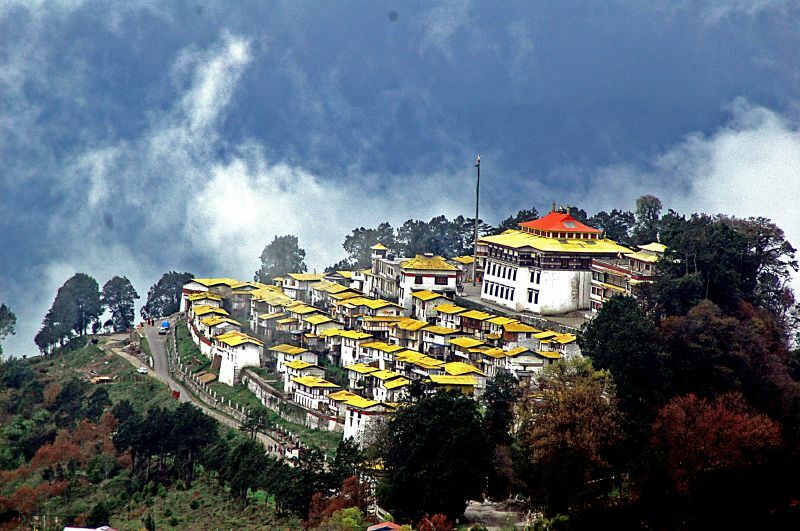 The trip was to inaugurate a memorial building constructed to house the tombs of the previous five Panchen Lamas. The 51-year old Lama, who was not in good health, died a day later, apparently from a heart attack, according to Chinese statements. His mother and father were taken to hospital with heart attacks the same day or the day before, and his senior tutor, also travelling with him, died from a heart attack the next day. This series of incidents led to unresolved doubts about the incident. A British pathologist commented at the time, "there is no such thing as an epidemic of heart attacks". 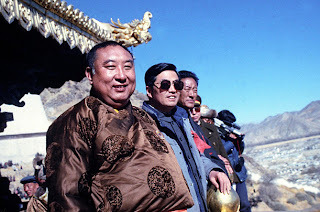 The Panchen Lama's last speech, of which a hand-written copy was sent to the outside world by Tibetan activists in Lhasa, is a powerful and uncompromising attack on ultraleftist tendencies in Chinese, and perhaps Tibetan, politics. Although many Chinese dignitaries were present, the speech appears to have been given in Tibetan. 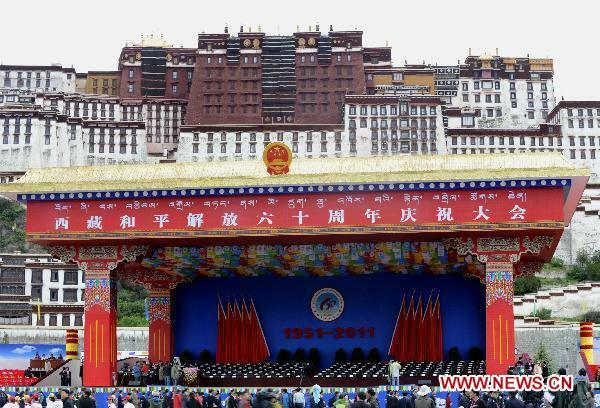 The Lama goes to great length in his speech to attack the politics which led to the destruction of the monasteries in Tibet, and appeared to dedicate the Mausoleum as a memorial to the destructiveness of earlier Chinese policy. "This has caused very bad consequences both inside and outside the country", he says. "These have all been systematically perpetrated under Leftist policies towards religion. This is a total mistake ... there is no doubt whatsoever that evil consequences will follow as a result of such mistakes," said the Lama, who did not suggest the mistakes or the consequences were already in the past. Chinese leaders are allowed to criticise the excesses of the Cultural Revolution, although the language used here is unusually strong. But the Tibetan leader makes a number of insinuations which suggest that he thought the excesses were not limited just to the Cultural Revolution period. He says that "the despicable vandalism ... in Tibet and Tibetan-inhabited areas" had taken place "mainly during the 'Cultural Revolution' and other periods during the successive political upheavals." "This is a total mistake committed both at the level of the collective and at the level of the individuals concerned", he said, in a phrase that could be read as a criticism of the Party as well as of the individuals involved. The speech is deeply and powerfully religious in parts, and calls for a qualitative understanding of religious freedom which could be seen as an important critique of the Party's claim to have allowed religious freedom: "It is neither a renovation work [intended] merely to hold religious functions, nor is it an attempt to follow the old society's traditional custom of renovating and opening monasteries. Rather than feel concerned about the number of monasteries in comparison to the past, ... my primary concern is not the numbers of monks and nuns but rather their quality in terms of their adherence to strict religious discipline and pure moral responsibility..."
Hu Jintao, then Party Secretary of the Tibetan Autonomous Region was accompanying the Panchen Lama when this happened. This has given rise to all sorts of suspicions. Vice-President Xi Jinping, whose father Xi Zhongxun was a friend of the Tenth Panchen Lama, went to deposit a khata (ceremonial scarf) on the stupa of the Lama. A simple, but powerful gesture. XIGAZE, Tibet, July 22 (Xinua) -- Vice President Xi Jinping on Friday called on the religious circle in Tibet to continue their efforts to promote patriotism and maintain ethnic and national unity. He called on religious leaders and members to make joint efforts with other Chinese people in building a well-off society. Xi, also a Standing Committee member of the Political Bureau of the CPC Central Committee, made the remarks during his visit with some members of the central government delegation to the seat of the Panchen Lama -- Tashilhunpo Monastery in Xigaze. Built in 1477, the Tashilhunpo Monastery is one of the most important monasteries of Tibetan Buddhism, the dominant religion in Tibet. Xi was welcomed by the monks of the Monastery. 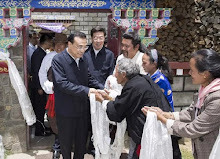 He paid homage to the stupa of the 10th Panchen Lama by presenting a "hada," a white scarf symbolizing best wishes. During his visit in Xigaze, Xi also met with local leading government officials, retired officials, representatives of local residents and officers of the the People's Liberation Army (PLA), the police and the armed police forces. Xi previously made an inspection tour to Xigaze in 1998 when he was the deputy provincial Party chief in Fujian, as part of the "pairing-up" support program for Tibet. Xi said he is pleased with the progress and development in Xigaze over the past years and appreciates the efforts of the local CPC organizations, government departments and local people. He called for more efforts to promote the "pairing-up" support program and to develop local agricultural and industrial sectors. Efforts should also be made to improve the infrastructure and local people's lives, Xi said. 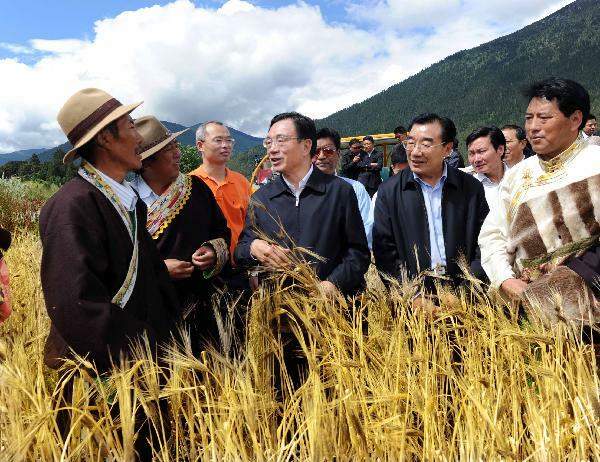 On Thursday and Friday, four other groups of the central government delegation visited Tibet's Nagqu, Qamdo, Lhasa and Ngari, respectively, and met with local officials and residents in these areas. 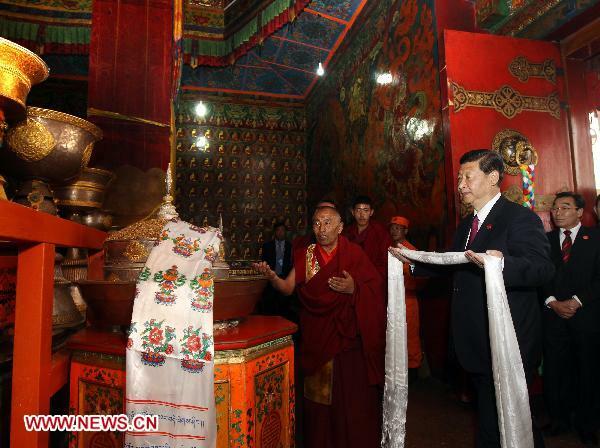 The 59-member central government delegation headed by Xi concluded the trip to Tibet on Friday and returned to Beijing. The delegation left for Tibet last Sunday to attend a series of celebrations marking the 60th anniversary of Tibet's peaceful liberation. This Xinhua report says that Bayi, the capital town of Nyingtri (Chinese: Nyingchi) is a village!It used to be a Tibetan village! It is now a modern Chinese town on the banks of River Nyang (a tributary of the Brahmaputra) at an altitude of 2994 metres. Bayi is an important timber and wool producing town. According to Wikipedia: "The new town completely absorbed the ancient village of Drakchi, which used to stand on this site. The population is now mostly Han Chinese. ...There are 9 villages under the jurisdiction of the township, with a total population of 21,400, from the Han, Hui, Mongolian, Xibe, Manchu ethnicities." 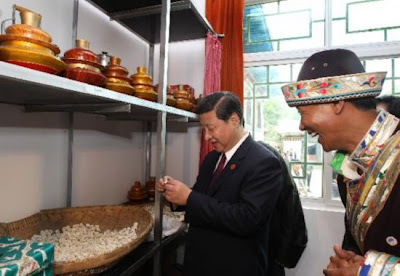 Very few Tibetans are left, Vice-President Xi however found some to taste chura, hard Tibetan cheese. As this map posted below shows Nyingtri Airport (and Bayi) are extremely close to the Indian border (the red line is the McMahon Line). It is the first time that such a senior leader ventured in this area which is also the base for a purported mega dam on the Brahmaputra (near the Great Bend of the river in the same county). Once again Xi spoke of stability: "People of all ethnicities in Tibet need to understand that stability leads to prosperity and separatist activities lead to disasters." This has been the leitmotiv of the visit, perhaps because Tibet has never been so unstable since 60 years. When Xi spoke to the PLA and PAPF (People's Armed Police Force) posted in Nyingtri, he did not mention China's southern neighbour, India. He just said that he appreciated "their contributions to the social progress, ethnic unity and the improvement of local people's lives in the area". Earlier, he had described Tibet “as an important national security screen for the country”. A rather mild term for a disputed border. But the objective of his visit was not to create more problems with India, but to see how to 'stabilize' the restive region. Zhang Qingli, the Party Secretary of the TAR accompanied Xi, in his southern trip. 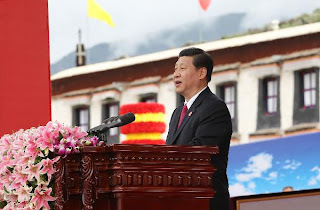 NYINGCHI, Tibet, July 21 (Xinhua) -- Vice President Xi Jinping Thursday urged Tibetans to unswervingly follow the Communist Party of China (CPC) to build a brighter future. 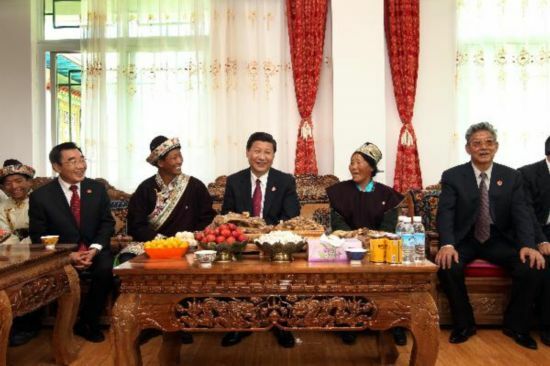 Xi made the remarks as he visited the village of Bagyi in Nyingchi Prefecture of Tibet Autonomous Region, one leg of his tour in the plateau region for celebrations marking the 60th anniversary of its peaceful liberation. Addressing the villagers, Xi said it was the socialist system, the correct leadership of the CPC, and the implementation of various preferential policies that led Tibetan people to their good life today. "People of all ethnicities in Tibet need to understand that stability leads to prosperity and separatist activities lead to disasters," he said. Xi visited Nyingchi 13 years ago when he was a senior official of southeastern Fujian Province. On Thursday, Xi visited homes of rural families of Nyingchi and was pleased to learn that many villagers had become rich. He asked the local officials to continue their efforts in advancing the area's development and maintaining the long-term social stability. He also called for more efforts to promote the tourism industry and protect the environment in the area. Xi also extended his greetings to the officers of the People's Liberation Army (PLA), the People's Armed Police Force and the police forces in Nyingchi, appreciating their contributions to the social progress, ethnic unity and the improvement of local people's lives in the area. One of the stakes of Vice-President Xi Jinping’s visit to Tibet is the fate of Zhang Qingli, the CCP Party Chief of the Tibetan Autonomous Region (TAR). Zhang has also been one of the most unpopular Chinese leaders to serve in Tibet in the recent years (so was his predecessor Hu Jintao, the present President who served in the ‘Autonomous Region’ between 1989 and 1992). 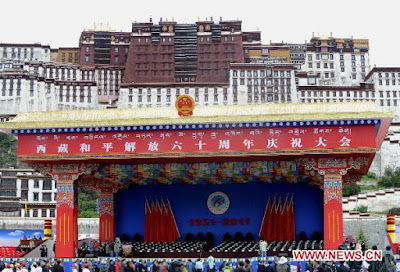 Interestingly, Xi’s visit to Lhasa was the second occasion to celebrate the 60th Anniversary of signature of the 17-Point Agreement considered by Beijing as the crucial document proving that Tibet has been ‘liberated’ peacefully and not invaded in 1950-51. It is strangle and rare in the annals of the PCR that a second celebration is organized, nearly two months after the anniversary day (May 23). Chinese are usually meticulous about dates. 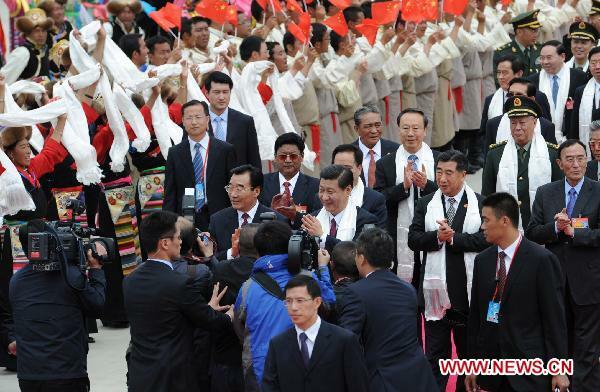 Some observers have presumed that it was due to the tight schedule of Vice-President Xi Jinping. Perhaps! Or was it an after-thought? Many analysts had earlier been wondering why the May celebrations were on such a low key? It was only a speculation as in any case the term of Zhang is soon coming to an end as he has been serving in Tibet since November 2005 (and he officially became Party Secretary in May 2006). It is true that Zhang did not endear the Dalai Lama’s supporters when he accused the Tibetan leader of being ‘a wolf in monk’s garb’. The rather low-key visit of Zhang Qingli in New Zealand and Australia attracted also commentaries as it occurred a few days before May 23. Some believed that Beijing did not want to highlight their ‘liberation’ of Tibet at a time when the situation was tense on the Roof of the World. ITC commented: “Zhang’s visits to New Zealand and Australia were so low-key that several parliamentarians in New Zealand with a keen interest in Tibet weren’t even aware he was in the country, and they were said to be ‘furious’ that they didn’t have an opportunity to meet him”. According to some sources Zhang left Lhasa for Beijing in early May with a large contingent of senior people from the TAR Standing Committee and local Government. Had he gone to discuss his promotion or retirement? 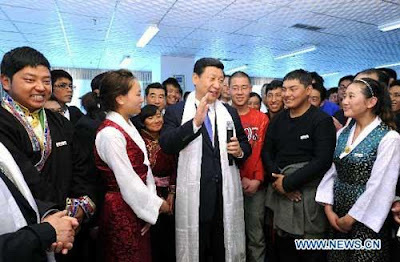 It appears now that he most probably went to prepare Xi Jinping’s present visit to Tibet. Many speculated about the presence of Padma Choling with Zhang to Beijing. Was he here to lobby for a post? Would he replace Zhang and be the first Tibetan to become the Party boss in Tibet? The visit of Zhang to Australia and New Zeeland (with TAR General Secretary Gongbo Tashi) can also be seen from another angle. As a friend put it: “This is the standard gift by the Party to senior officials about to leave their post after achieving a high performance rating. The Governor of Sichuan, Jiang Jufeng recently visited India prior to retirement”. Zhang and Gongbo Tashi came back from New Zeeland via Hong Kong. They were there a day before the fateful Day (May 23). They probably flew the same day to Lhasa to be in time for the first part of the ‘celebrations'. That day a forum was also organized in Beijing with all the military and PAP commanders as well as the surviving Party Secretaries and Deputy Party Secretaries of the TAR. Only after the second ‘celebration’ of 17-Point Agreement was announced, one could understand better the low-key level of the first one, especially as the ‘real’ celebration was to be presided by the PRC’s Vice-President himself (like the then Vice-President Hu Jintao presided over the functions in Lhasa and Shigatse in May 2001 for the 50th anniversary). It is however significant that for the first time such an important event (at least for Beijing) is celebrated two months after the proper date (July 18, instead of May 23). 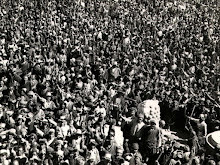 In 1980, the then Party General Secretary Hu Yaobang arrived in Lhasa on the right date. ITC’s theory of that Zhang Qingli’s ‘stock is rapidly falling in Beijing’ might not be correct; the truth is probably that Zhang has completed his term. One of the main outcomes of the visit will be the selection of a new Party Secretary for Tibet. Will Padma Thinley (alias Pema Choling), the present Chairman of the Tibetan Autonomous Region be the first ethnic Tibetan to run the affairs of the region? It remains doubtful that Beijing could trust a Tibetan for such an important job. However after his visit in Lhasa, Xi Jinping is bound to have a larger say in the selection process. 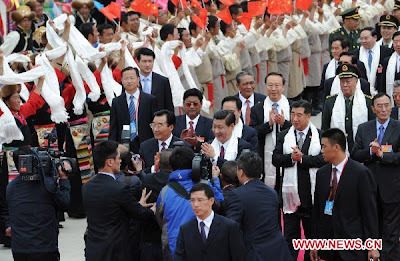 As I noted in previous postings, the Chinese Panchen Lama did not appear on the stage on the side of Xi during the celebrations. Is it a sign of appeasement for the Tibetans who do not believe in the legitimacy of the candidate selected by Beijing? Possibly, though the visit to Raidi’s hosue is bound to appease the hardliners amongst the Party in Beijing. Xi is walking on a tight rope before his elevation to the supreme job in October 2012. He has probably to please all the parties involved in the Great CCP Game. 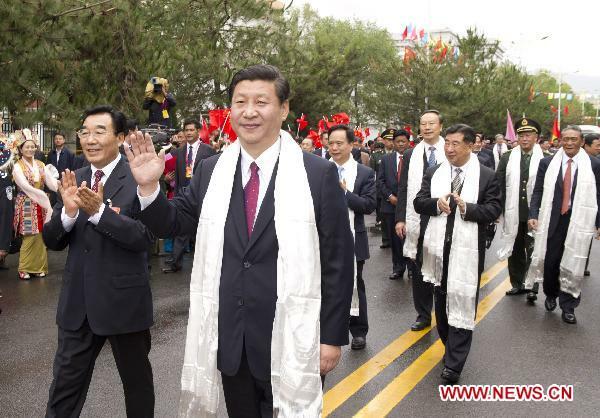 Xi Jinping's visit to Tibet continues. The Vice-President met with the PLA officers serving in the 'autonomous' region. Once again he insisted on the 'stability', an euphemism for the problems facing China in their 'liberated' province. Tian Xiusi, Political Commissar of the Chengdu Military Region and more importantly Wang Jianping, Commander of the Police Armed Forces, responsible for the 'stability' in restive regions like Tibet or Xinjiang were in attendance. Also present was Song Dan, the Deputy Director of the Central Military Commission and of the General Office of Legal Department. Xi asked them to "improve their capabilities in taking preventative actions and handling emergency situations". They have been quite 'busy' during the past few months, Tibet living in a practical state of siege. As mentioned earlier, the Chinese Panchen Lama is not in list of invitees. Ten years ago, when (then) Vice-President Hu Jintao came to Tibet, he met the young Panchen Lama in Shigatse. Xinhua reported: "Hu Jintao and party also went to Tashilhunpo Temple, where they presented a hada [khata] at the soul tower [stupa] of the 10th Panchen Master, gave alms to the monks, and presented a copy of the Great Tibetan Scripture. Hu Jintao acknowledged the contribution the Tashilhunpo Temple has made to maintaining the unity of the motherland and its peoples. He urged the masses of the monks to abide by Chairman Jiang Zemin's instruction, 'protect the nation and benefit its people', to carry on the glorious tradition of the 10th Panchen Master's patriotism and love of teaching, and to continue to make new contributions to the steady development of Tibet. Hu Jintao indicated that he was extremely happy to see the 11th Panchen growing healthily, and that he was confident that the 11th Panchen would work hard to become a good living Buddha who loved his country and loved teaching." Let us see if Xi visits Shigatse and the Tashilhunpo. 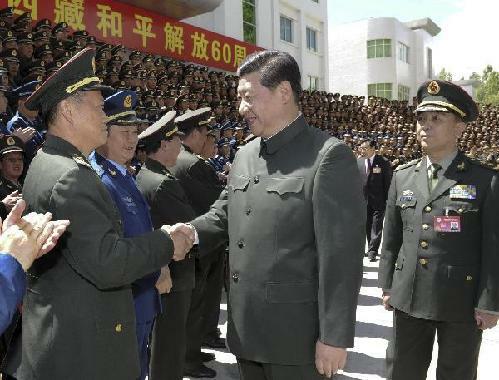 [caption] Chinese Vice President Xi Jinping, who is also a member of the Standing Committee of the Political Bureau of the Chinese Communist Party (CPC) Central Committee and vice chairman of the Central Military Commission, meets with officers of the army stationed in Lhasa, capital of southwest China's Tibet Autonomous Region. Xi, heads a central government delegation to celebrate the 60th anniversary of Tibet's peaceful liberation, greeted officers of armies and armed police stationed in Lhasa, local policemen and legal affairs officials here on Tuesday. Vice President Xi Jinping on Tuesday visited senior officers of the People's Liberation Army (PLA), the People's Armed Police Force and the police forces stationed in Tibet. Xi conveyed greetings from the CPC Central Committee, the State Council and the CMC to the officers. Xi expressed his appreciation for their contributions to the security of the country's southwestern border as well as their contributions to the social stability and development of Tibet. "The social stability in Tibet matters to the country's stability, and Tibet's security matters to national security," Xi said. Xi called on the officers to always be sober-minded and improve their preparedness in safeguarding the national unity, security and in maintaining the stability in Tibet. He asked the forces to take concrete measures to improve their capabilities in taking preventative actions and handling emergency situations. He also told the officers to follow the country's ethnic and religious policies and strengthen ethnic unity in their work. Vice-President Xi Jinping made it a point to visit the house of the old Tibetan hardliner Raidi. According to Xinhua: "Chinese Vice President Xi Jinping, who is also a member of the Standing Committee of the Political Bureau of the Chinese Communist Party (CPC) Central Committee and vice chairman of the Central Military Commission, greets senior Tibetan leader Raidi, vice chairman of the Standing Committee of China's 10th National People's Congress (NPC), at Raidi's home in Lhasa, capital of southwest China's Tibet Autonomous Region." Raidi has been the Chairman of Tibet Autonomous Regional People's Congress Standing Committee from 1993 to 2003. This period saw large scale repression and since then Raidi has been considered as a hardliner amongst 'ethnic Tibetans'. In 1994, Xinhua reported that on the occasion of the 10th anniversary of the promulgation of the so-called "Law of the People's Republic of China on Regional Autonomy for Minority Nationalities", Raidi declared that the law had "forcefully promoted economic construction and social stability in Tibet." 'Stability' has been a key word in Communist jargon, but it is still missing in the daily life of the people of the Roof of the World. At that time, Raidi gave figures for gross regional product in 1993, total agricultural and industrial output values and total import-export volume. He declared: "the people's material life and cultural life continue to improve", adding: "Beijing is to help build a number of key projects in the second half of this year. We should treasure the current hard-earned political stability and unity as we treasure our own eyes and we will not allow the existence of any kind of splittist activities; an attempt by a small number of splittist elements to promote Tibet Independence' and to reverse the wheel of history is very unpopular, is not allowed by law and is destined to fail ". Seventeen years later, Tibet is still practically under a state of emergency. 1- Xi Jinping has decided to follow the hardline started by Hu Jintao since the end of the 1980's. 2- Xi Jinping has no choice but to be 'nice' with the hardliners a year before his elevation to the supreme job. Only the future will tell us what is in store for Tibet and the Tibetans. By the way: have you seen the Chinese Panchen Lama around? LHASA, July 18 (Xinhua) -- Vice President Xi Jinping visited the homes of two senior Tibetan leaders and commended them on their devotion to building the new Tibet on Monday afternoon. My article Despite denials, China has a big problem in Tibet is posted on Rediff.com. "The logical next step for a nation promoting democracy in North Africa or the Middle East would have been to invite the 'elected' leader of the Tibetan diaspora along with the Dalai Lama [ Images ]. But no, Washington prefers to receive the Dalai Lama and ignore Dr Lobsang Sangay, the new 'elected' Kalon Tripa. 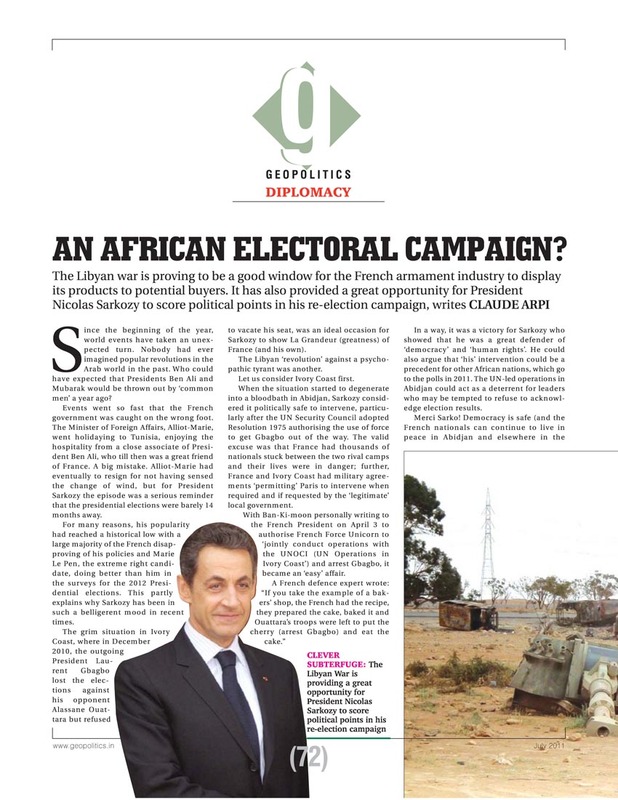 It is more convenient to receive a 'religious' leader, says Claude Arpi". Read on by clicking on the title. My article An African Electoral Campaign? 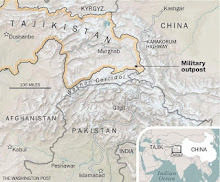 has been published by Geopolitics. It is available online by clicking here. The main article in Xinhua (as well as other Chinese media) reported that "a delegation of China's central government arrives in Lhasa, capital of southwest China's Tibet Autonomous Region"; it did not mention the name of the head of the delegation. His name sometimes appeared in the caption. Xi Jinping, the Vice-President of the PRC and future Party General Secretary (as well future Chairman of the all-powerful Central Military Commission) paid his maiden 'official' visit to Tibet (he has probably been to Tibet as a kid when his father Xi Zhingxun was looking after Tibetan affairs in the 1950's, but Xi Jr was a toddler at that time). In other articles, Xi's name is mentioned, but it remains strange why his name did not figure in the lead article. Something to do with a not-so-smooth succession? The Chinese ways are sometimes difficult to grasp. The old 'Tibetan' guard (Raidi, Pagpalha) traveled from Beijing with Xi, but also the PLA Chief. Let us hope that it will be noticed in India. According to another communique: "Senior officials traveling with Xi include Vice Premier Hui Liangyu, Li Jianguo, vice chairman and general secretary of the Standing Committee of the National People's Congress (NPC), Du Qinglin, vice chairman of the National Committee of the Chinese People's Political Consultative Conference (CPPCC) and head of the United Front Work Department of the Communist Party of China (CPC) Central Committee, Pagbalha Geleg Namgyai, vice chairman of the National Committee of the CPPCC, Raidi, vice chairman of the Standing Committee of the 10th NPC, and Chen Bingde, chief of the General Staff of the Chinese People's Liberation Army." The Tibetans are happy and liberated. It is basically what Beijing affirms in a White Paper on 'The Liberation of Tibet' recently released by the State Council's Information Office. A communique says: "The 60 years following Tibet's peaceful liberation have proved that Tibet, as an inseparable part of China, shares its destiny with the motherland, and its development is also impossible without that of China". One discovers astonishing information: "After the founding of the People's Republic of China in 1949, Tibet was peacefully liberated. Under the leadership of and with special care from the Central People's Government, and through democratic reform, the founding of the autonomous region, socialist construction and the reform and opening-up, Tibet abolished serfdom and theocracy, become a modern, democratic socialist society, achieved rapid and comprehensive economic and social development, and embarked on the road to modernity." According to Beijing "Tibet's 60 years of development would have been impossible without the care of the Central Authorities". Without commenting on the 'democratic socialist society' (it used to be called the 'dictatorship of the proletariat'), facts on the ground do not tally with the words of the White Paper. 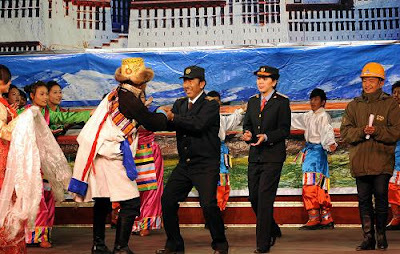 Why should Tibet be closed to foreigners for any special 'celebration' if the life is so rosy and if the Tibetans are so grateful to the 'Motherland'? As the White Paper was released, the Tibetan Centre for Human Rights and Democracy (TCHRD) announced that the Kardze County People’s Court sentenced 13 Tibetans out of many others arrested. TCHRD says: "The Chinese Authorities have begun to restrict and suppress the monasteries and the common people in Kardze County. There has been an increase in the arrest on doubt cases. For example, on July 5th 2011, in Kardze Dhargyal Monastery, the local police came and interrogated the monks and especially the monks who returned from India. Monk Lobsang Choejor (35) and monk Jampa Wangchuk (46) were interrogated and then taken into Kardze Detention Centre and till date they are in detention center." The TCHRD further stated that on July 5th, 2011 the Public security Bureau arrested Pema Rinchen, a famous writer from his house in Drango County of Kardze Prefecture,: "On July 6th, 2011, the second day of his arrest he had to be taken to the Drango County Hospital for emergency treatment, because he was reportedly savagely beaten by the police after his arrest. His injuries are believed to be caused by severe beatings by the police. On hearing the news, his family members rushed to hospital. However, several policemen were standing guard outside his hospital room and refused to allow his family to see him". Examples in Kirti monastery and elsewhere could be multiplied. What is flabbergasting is that Beijing continues to publish photos of 'happy Tibetans' enjoying life under their benevolent and compassionate 'Motherland'. My article Reviving faith in tradition appeared today in The Pioneer. Click on the title to read. Though this article of Yoginder Sikand in Rediff.com is thought-provoking, I will not venture to comment on the historical truth behind the hypothesis. However, there is no doubt, and it was confirmed by the ISI, that a vihara existed below the masjid. It remains me of an article that I wrote in 2004, and which, for some reasons that I can't remember, was never published. I suggested that the Dalai Lama could be a mediator in the Ayodhya tangle. Here is my article. Interestingly, some 3000 Buddhist monks lived there in a hundred big and small viharas, belonging to the two branches of Buddhism: Hinayana and Mahayana. While else where, serious disputes (and sometimes worse) erupted regularly between the proponents of each school, here in Ayodhya the monks lived in harmony, sharing the common facilities of the viharas. This tradition of tolerance in a city where Buddhist masters such as Asanga and Vasubandhu preached and practiced, prompted the Dalai Lama to send an appeal to the two parties involved in the bitter Ramjanmabhoomi-Masjid dispute on the Christmas Day. He said that he considered the row as “a temporary aberration” and he believed that “the issue can be resolved through mutual trust, mutual faith and mutual respect. Its politicization only adds to its complexity and makes it more difficult to find an enduring, amicable and widely acceptable solution”. He concluded by fervently appealing “to all for a mature and open-minded approach to this issue so that the spirit of tolerance and brotherhood is restored”. Deputy Prime L.K. Advani immediately responded to the Tibetan leaders’ appeal. He asserted: "The government would not only encourage but also actively participate in any serious and reasonable effort to settle the issue in an amicable manner." While giving the assurance that his Party would use its power to convince “those who had launched the movement for Ram Temple at Ayodhya to participate in any amicable settlement on Ayodhya”, he added that the government was ready to act as the facilitator if needed. Even more heartening is the fact that several leaders of both communities reacted favorably to the appeal. The RSS and other Hindu organizations as also the Diwan-e-Sharrief of Ajmer, the Shahi Iman of Delhi and several other Muslim leaders welcomed it. This brings some hope for the New Year. It reminds me of an interview I had once with the Tibetan Prime Minister: he explained that according to his tradition, a political system in which a leader is elected by 60% of the people but rules against 40%, can not be considered as ‘democratic’. 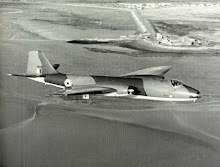 In this sense, the solution proposed to have an adjudication by a Court of Law or a Parliament legislation by a majority vote appears unable to provide a long-term solution to such a dispute. If a consensus is found, the legal imprimatur of the Supreme Court on a negotiated settlement could always come later. In International politics, the term ‘win-win’ has recently become very fashionable. Would it not be in the fitness of things that a ‘win-win’ solution is arrived at in the ancient city of Ayodhya? There is another interesting aspect to the Dalai Lama’s appeal: for years a rumor has been circulating that a Buddhist vihara was buried beneath the Hindu temple built in the 11th-12th century. When the excavations were conducted by the Archeological Survey of India (ASI) under the supervision of the High Court in Lucknow between March and August 2003, some remnants of older structures were found. In the Summary of its findings, the ASI described the different layers exposed. Though the media attention concentrated on ‘the massive and monumental structure found below the disputed structure’, earlier constructions and artifacts belonging to the Kushan and Gupta periods were discovered in the deeper layers. It may be difficult to ascribe with certainty these remains to a temple or a vihara for the simple reason that the period was very eclectic in its beliefs. Different philosophies, systems of yoga and practices co-habitated in places like Ayodhya; architecture and building technology were not very different whether they belonged to one faith or another. Even regal patronage was often offered to both temples and viharas. It is to the credit of the Nobel Peace Prize Laureate who knows about the ancient Buddhist past of Ayodhya that he did not make any claim of a Buddhist temple existing on the disputed site. The Tibetan leader, a refugee since over four decades in what he considers “Aryabhumi”, has shown the inhabitants of India that tolerance, the most sacred principle of ancient India, had been kept alive in the Land of Snows. He restated that recently: "I am optimistic about a solution to the Ayodhya problem because India is the only country with centuries-old tradition of religious tolerance. Here, all religions exist together, something impossible in other countries." For the Tibetan leader, this appeal is perhaps a means to repay the debt of his people to the Land of the Buddha. Maybe one day after a solution to the vexed issue is found, when both communities begin smiling again, a small token of gratitude could be offered to the Dalai Lama. Not to him personally of course, but to his nation which was able to preserve the old Indian tradition of tolerance. This token could be a small shrine in a corner of the site, in sight of a majestic Ram temple with a mosque not too far. It would be dedicated to the great sons of Ayodhya, the Buddhist masters Ashvaghosa, Asanga and Vasubandhu who once lived and preached the Middle Path in this holy city. This would be fair. How about a Buddhist vihar in Ayodhya? 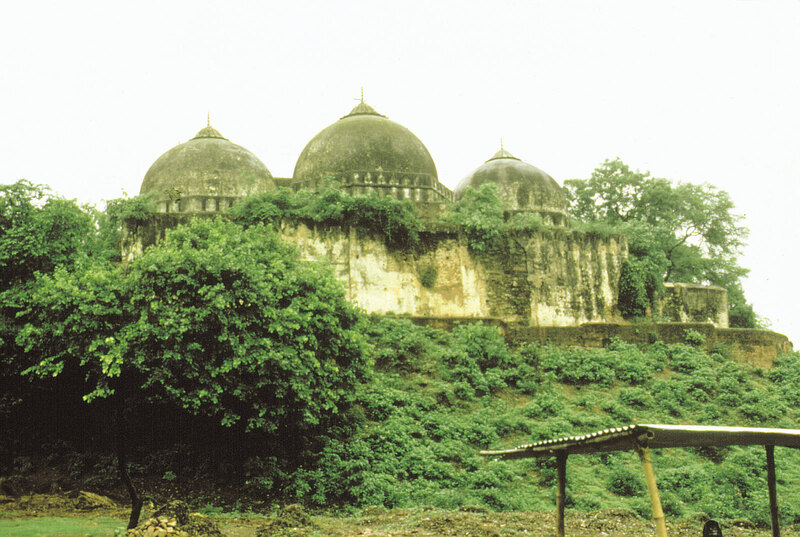 The conflict over the now-destroyed structure in Ayodhya, whose chief antagonists have consistently sought to pit Hindus and Muslims against each other, has a hidden dimension representing a third party which, if recognised, could well provide a meaningful solution to the still-unresolved dispute. So writes Balwant Singh Charvak, a noted Ambedkarite scholar from Uttar Pradesh [ Images ], in a book which I recently came across appropriately titled Ayodhya Kiski?Na Ram Ki, Na Babar Ki ('Whose Ayodhya? Neither Ram's Nor Babar's'). Echoing several other Dalit ideologues who have made similar claims, Charvak argues that the disputed spot in Ayodhya belongs to neither Hindus nor Muslims but, rather, to an ignored third party -- Shudras and Buddhists. This spot, he claims, is where a grand Buddhist temple, dedicated to a Shudra rishi, Lomash (later identified, so he says, as a Boddhistattva or Gautama Buddha in one of his previous lives) once stood. In his 230-odd page Hindi book, which is based on meticulous research, Charvak argues that there is no evidence of any Ram temple having stood on the site occupied by the erstwhile Babri Masjid [ Images ]. Indeed, he argues, the cult of Ram centred in Ayodhya is of relatively recent origin, and is certainly a post-Buddhist development. He contends that the disputed spot in Ayodhya was actually a hallowed centre of worship of 'low' caste untouchables and Shudras even before Ram's birth, for it was there that a Shudra saint named Lomash was born and where had set up his hermitage. His son Shambhukh, also a saint, was, so he contends, also born in the same place. The father and son were both renowned for their piety, and were immensely popular saints among the Shudras, who were shunned and scorned by the 'upper caste' Hindus. According to the Ramayana [ Images ], Charvak writes, Shambhukh was killed by Ram for having violated the Brahminical code of caste conduct by engaging in tapasya or stern authorities in the hope of entering heaven, something that was forbidden to 'low' caste Shudras by the Brahmins and their religion. This indicates, Charvak adds, that Ram was an ardent defender of the inequitous caste system, which was premised on the degradation of the Shudras. Because of its association with the Shudra hero-saints Lomash and Shambhukh, Charvak writes, the presently disputed spot was widely revered among the Shudras for centuries. Later, Gautam Buddha is said to have visited Ayodhya, and Charvak argues that it was near Lomash Rishi's chaitya or shrine, supposedly constructed on the disputed spot, that he announced, so Charvak claims (based on a reference to the widely-known Buddhist text The Questions of King Milinda) that he had been Lomash Rishi in one of his previous births. In other words, Charvak argues, Lomash Rishi was actually a Boddhisattva. The bigoted Brahmins of the area, fearful that the Buddha's charisma and teaching would attract people to him and that this would threaten their control and privileges, issued orders that no one was to give food or water to the Buddha and his bhikkhu followers accompanying him. Defying their diktat, a woman called Anitya, a Brahmin's servant, provided the Buddha with water, which so angered her Brahmin master that he beat her to death. This incident, so Charvak argues, took place at the presently-disputed spot, which added to its religious importance for the Shudras. Soon, the spot also became a hallowed one for Buddhists (many of whom were of Shudra origin) particularly because, or so Charvak says, the Buddha had visited the place. Prior to the Buddha's visit to Ayodhya, or the Buddhist Saketa, the disputed spot, so hallowed to the Shudras, hosted a chaitya or shrine to Lomash, but after the spread of Buddhism, Charvak argues, a massive Buddhist temple or vihar was constructed on it in honour of 'Lomash Boddhisattva' and other Shudra saints. Charvak quotes well-known historians who have testified to the importance of Ayodhya/Saket as a great centre of Buddhism and of it having once hosted a vast number of Buddhist temples. However, Charvak argues, with the decline of the Mauryas, Buddhism, too, experienced a decline, and when, in the first century BC, the Brahmin Pushyamitra Sangha murdered the last Mauryan king and came to power over much of northern India [ Images ], he let loose a virtual genocide of Buddhists, destroying many of their temples, including possibly the Buddhist vihar that Charvak claims was built on Lomash Rishi's hermitage, the site of what Muslims claim to be the Babri Masjid. When, in the early sixteenth century, Babar or his general Mir Baqi arrived in Ayodhya the ruins of this Buddhist temple, built on a spot that Charvak argues was for centuries holy for the Shudras and Buddhists, were lying scattered about, having, so Charvak says, long since been destroyed by Brahminical revivalists who were as opposed to the Buddhists as they were to the Shudras. Babar or Mir Baqi simply put together the scattered ruins to build what is now known as the Babri Masjid, Charvak writes. In other words, he contends, the structure that originally stood on the disputed spot was not a Ram temple but, rather, a Buddhist vihar, and that it was destroyed not by Babar or any other Muslim but, rather, by anti-Buddhist Brahminical revivalists. Charvak backs his claim by asserting that relics unearthed during excavations around the disputed site show clear evidence of his claims and do not suggest any proof whatsoever of a Ram temple having stood on the spot. Based on references in an ancient Pali Buddhist text, the Dashrath Jataka, he also raises the possibility that Ram was born not in the present-day Ayodhya, on the banks of the Saryu river, but, rather in another place once also referred to as Ayodhya, located on the banks of the Ganga in Kashi, where, according to the Dashrath Jataka, Ram's father orginally ruled. If this is true, Charvak argues, the claim that the presently-disputed spot marks the place of Ram's birth is void. Charvak is not the only person to have argued on these lines -- numerous noted Buddhist and Ambedkarite scholars and activists have made somewhat the same claim. That Ayodhya was once a thriving centre of Buddhism is well-known, as is the fact of Brahminical revivalists destroying vast numbers of Buddhist temples (as did many intolerant Muslim iconoclasts) or taking them over and Hinduising them across India. Whatever the case may be, a vihar dedicated to the Buddha, the apostle of universal love, instead of a Brahminical Hindu temple or a Muslim mosque, being built on the disputed site, might actually be a mutually acceptable and eminently sensible settlement for many Hindus and Muslims themselves, who are fed up of the hate-driven politics of mandir and masjid being played in their name. This is good news. If India and Bangladesh decide to collaborate and jointly make efforts to share the Brahmaputra's waters. It can only pressurize China to join and sign a Treaty which will assure the co-riparian States of a fair deal. It goes in the sense of my recent posting: a Joint Treaty on Water Sharing with China. It is a great pity that the Prime Minister has decided to kick the Environment Minister up; he could understand these important issues. As often, wrong decisions at a crucial time. Once again, powerful lobbies must have prevailed. 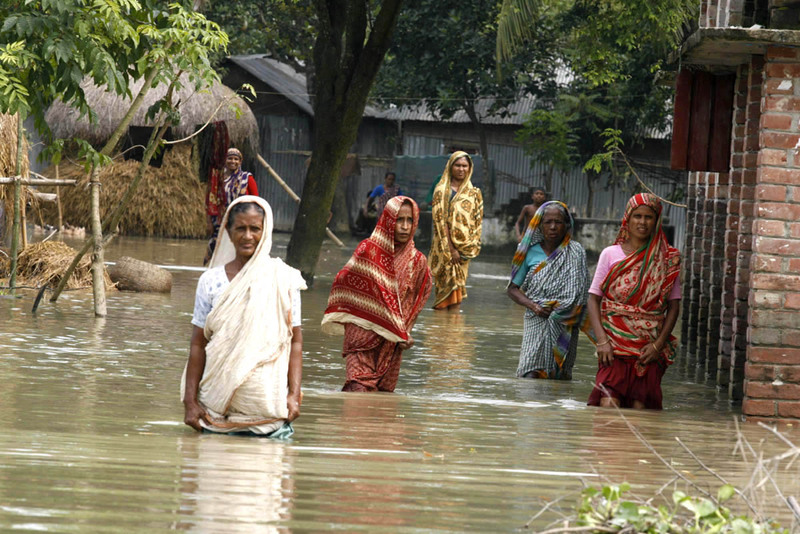 From Pallab Bhattacharya Dhaka, July 7 (PTI) Bangladesh today suggested a joint approach by co-riparian countries to address the issue of sharing of the Brahmaputra waters in the wake of reports that China was planning to build a dam on the river in Tibet. "We have been talking about joint sharing of water resources among countries of the region. I think there is now an understanding among all neighbours of the region to work together in this regard," i told a group of Indian journalists here.Answering a question on the Chinese plan to build a dam on Brahmaputra river in Tibet, she said "co-riparian countries will have to act together on the issue but it is going to take a long time." Moni expressed the hope that none of the neighbours would do anything which would have a negative impact on each other. Her remarks assume significance in the backdrop of reports about the Chinese move to construct a dam on the river Yarlung Tsangpo, as Brahmaputra is known in Tibet, and deep concerns over its impact on water availability to northeastern India and further downstream Bangladesh. External Affairs Minister S M Krishna, who is on a three-day visit here, had said earlier that India was monitoring China's activities on the river, but dismissed the reports about a firm plan to construct the dam. 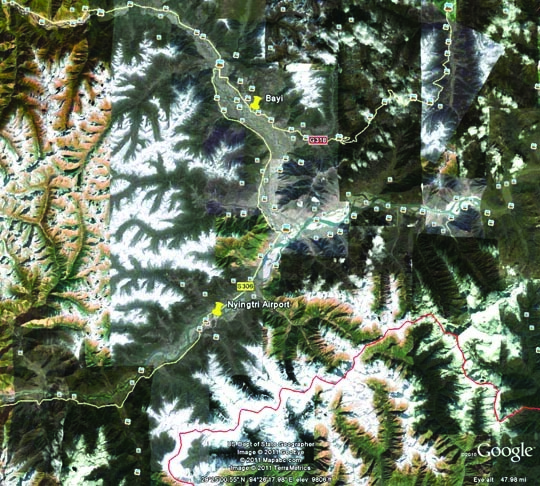 Reports also said China is planning to build a run-of-the river project on Yarlung Tsangpo. The 17th Karmapa has finally been permitted to visit the United States to attend Kalachakra Puja in Washington. The Dalai Lama, along with his monks of Namgyal Monastery, will conduct rituals which will last 11 days. A few months ago, the Karmapa Lama made headlines when the Himachal Pradesh police seized foreign and Indian currency worth 4 or 5 crores, stuffed in four large metal boxes, from a room of the Gyuto Ramoche Monastery, the seat of Ugyen Trinley Dorje, the Karmapa. The monastery is located some 15 km away from Dharamsala where the Dalai Lama lives. 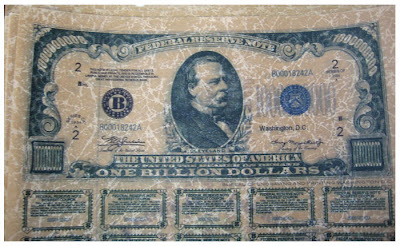 Because the currency notes seized from the monastery were from nearly 20 countries, including China. The media speculated further, "Is the Karmapa a Chinese agent in India?" The Karmapa's office immediately issued a statement refuting allegations about the China link. Later, the Enforcement Directorate accepted that the cash found in the monastery came from offerings received mostly during the celebrations to mark the 900th year of the birth of Dusum Khyenpa, the First Karmapa. Ugyen Trinley, the successor of Dusum Khyenpa had presided over the two-day celebration held in Bodh Gaya, attended by thousands of followers from India, Tibet, China and other countries. The Office of the Karmapa explained that it had started the process of acquiring a piece of land to build a new monastery: "For this, the Himachal Pradesh government was also approached to get clearances." Everyone still had in mind how the 15-year old Karmapa, in a Bollywood-type escape, reached Dharamsala in January 2000 after crossing the highest Himalayan passes in the midst of winter. The Indian government was initially reluctant to grant him refugee status. Some of his entourage seem to have made contradictory statements. Some Indian officials believed that he had been 'planted' by the Chinese government to create confusion over the Sikkim issue (Beijing 'recognized' Sikkim as a part of India two years later only). Things had become complicated when a dispute erupted with another 'Karmapa' claiming the throne of Rumtek monastery in Sikkim. The previous Karmapa, 16th of the lineage, was one of the most revered Lamas of his generation. A powerful yogi, he impressed all those who approached him with his profound wisdom and an aura of strength and peace. 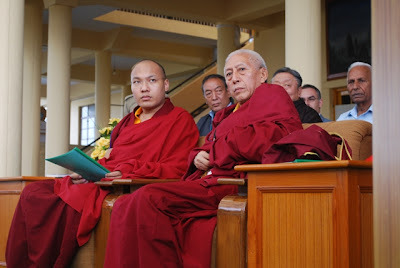 In 2011, further complicating factor was the fact that the media (Indian and foreign) often tried to project the young Lama as the Dalai Lama's political successor. The media forgets that the present Dalai Lama has ceaselessly worked from the early 1960s to introduce democracy in the exiled Tibetan community; to have a 'political successor' would negate all these years of hard work. Fortunately this problem has now been solved with the election of a new Prime Minister by universal suffrage. Since a long time I was keen to ‘see’ and meet the young Lama. I recently had the occasion to visit the Gyuto Ramoche Monastery in Sidhbari where the Lama has been offered a temporary accommodation. The 26-year old monk lives here, surrounded by relatively tight security, with the majestic Dhauladhar range as a background. Till now the Karmapa had refused to speak and comment on the accusations leveled against him. I discovered a remarkable calm young man, deeply interested in Indian culture, in art and the environment of the Himalayas, who is able to see the deeper meaning of the controversies that have surrounded him. The gurus of his gurus have been Indian some 900 years ago; knowing the reverence the Tibetan Lamas have for their teachers, is fundamental point to understand his ‘present life’. He also emphasised his deep gratitude to India: “when Tibet went through a critical period, Tibetans turned to India. India has been a great host”. But there is more; he feels that India has provided a sanctuary for the preservation of Tibet’s Buddhist religious and cultural heritage which has been destroyed after the Chinese invasion. This is an important point: “When the times were so difficult, when we were in such an utterly helpless situation, to whom did we turn? To India!”, he says. A most interesting project the Karmapa is involved is the revival of the Sanskrit tradition in the Tibetan monastic tradition, Often at the beginning of religious functions, when the Sangha, the community of monks and nuns gather together, prayers are chanted in their original Sanskrit. He has decided to collect these ‘realisation’ songs and revive them by having them sung again in their ancient form: “We have treasured these sacred dohas for many centuries in Tibet” He wants now to ‘return them to India. When I ask about the recent allegations, he says that he has directly or through some of his Indian supporters communicated “with prominent Indian leaders”. The press reported that a delegation met Dr Manmohan Singh and Sonia Gandhi. The only time he lost his cool was when i asked him why the Chinese always the Dalai Lama and not him. His answer was sharp: “Just because the Chinese government does not single someone out for public criticism, can this justify accusing this person of being a Chinese spy?, adding: “Obviously, the Dalai Lama is specifically targeted for criticism by the Chinese government because he has this prominent leadership role and he leads the cause so very well”. Interestingly, when I mentioned all the difficulties he has been facing since he escaped to India 11 years ago, he said he believes that these sort of obstacles cannot be solved ‘technically’: “Ultimately, only spiritual transformation will work”. I must say that I was impressed by this young man, who has gone through difficult times (some of his own making). But having met him after a gap a 5 years, I see much greater depth and maturity in him. Somehow, it is good that he does not have the burden to be the ‘successor’ of the Dalai Lama anymore, this will give him the possibility to bloom on his own accord and show his strong attachment to India and its tradition.